One of my major pet peeves is seeing someone cook while wearing jewellery. Why anyone would (for example) mix ingredients with their hands, without first removing their rings, is totally beyond me! Your jewellery may be beautiful, but the microscopic germs lurking on and under its surfaces could put you out of action for days! So before you startcooking, remove the BLING! It should go without saying, but it’s really essential that the rules of good hygiene must be closely followed in the kitchen. The germs that can cause food poisoning are usually controlled by heating (cooking) and/or chilling (refrigerating) our food, but given half a chance, they can easily spread around the kitchen — via hands, chopping boards, cloths, knives and other utensils. Rule 1: Clean kitchen surfaces after every stage of preparing your recipe. Try to ‘clean as you go’. This may sound a little obsessive, but it’s not. Raw meat, poultry, fish, eggs and many other raw foods are the most common sources of germs, but they can easily cross-contaminate other foods. After handling these foods, always wash your hands, utensils and surfaces thoroughly before you touch anything else. Rule 2. One important way of stopping cross-infection is to make sure that you always use a different chopping-board for your raw meat and everything else. If you keep one for raw meat and fish, and another for all your other chopping, you will be making a major contribution to your health and kitchen safety. Rule 3. After use, wash all your dishes and utensils with hot water and dish washing liquid. (Don’t just run them under the water faucet!) Change the water regularly, then rinse in clean, hot water. When possible, leave every thing to drain until dry. Rule 4. Use paper towels whenever possible, if you can afford to buy them. Dish towels can be a source of cross-contamination so use them sparingly and change them regularly. Be sure to wash them in a hot-wash cycle. 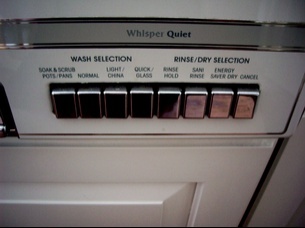 Rule 5: Use the “sani-rinse” cycle on your dishwasher if anyone in your household has a cold or the flu. This is a REALLY hot cycle that totally annihilates germs and bacteria. This is a good start on Kitchen Hygiene. What’s next on the Kitchen Hygiene list? Kathy, you’re going to laugh at my question I know, but…are there are special hygeine considerations for cooking with eggs, disposing of egg shells, etc., beyond what you’ve already discussed in earlier egg posts? Remember the kitchen sponge. Wash and rinse it, then stick it in the microwave for 30 seconds. That will kill all the bacteria. If by the time you get home from the grocery store an egg has cracked, be sure to throw that egg away. Even if itâ€™s only a tiny crack! Germs can lurk in the strangest of places. As for disposing of egg shells, my mom never let us put them in the garbage disposer. She said they turned to powder and clogged up the works. I donâ€™t know if thatâ€™s true or not, but to this day I just toss the shells in the trash can. As a family we can most certainly agree with your mother about egg shells in the waste disposal . Having had to get elbow deep in gloop (yuch) we can confirm that egg shells do nasty’s to your drains. I always clean my sink with Comet or bleach and hot water after I wash poltry and or meat. Hi Marla, Iâ€™m glad you brought up washing meat and poultry. Much to my surprise, the USDA says not to, but certainly many packages of chicken say rinse under cool water and pat dry. What do all my experienced cooks recommend? All of the information that you “guys” have shared, is very informative and helpful. USDA says not to wash poultry and meat in the kitchen sink because their thinking is that washing will only spread Salmonella or E. coli , but in most cases it is necessary to wash meat and poultry. The sink should be sanitized after washing raw food in it, make sure that there are no utensils, especially no plates or other tableware when washins meat/poultry. It is a good idea to have 2 sinks one for dishes and one for food items, and another smaller on for handwashing onlt, like what restaurants are supposed to have. Hi Libina, thanks for all the great tips! I may have a little tip for cleaning chicken or fish. The ladies in my life tend to clean them with lime. I actually use that secret now as I cook for my family. It works, you can feel the difference. You can taste it a little bit depending on how long you leave it on but it’s worth passing on. When roasting a chicken I often squeeze some fresh lemon juice inside the cavity of a chicken to add flavor and aroma. Rubbing chicken or fish with fresh lemon or lime juice will brighten the flavor! Kitchen utensils and surfaces should all be wiped after use and cleaned with hot soapy water. All other areas need frequent cleaning too; the fridge, microwave, floor, food cupboards etc. Make sure the kitchen is kept dry as well as clean. 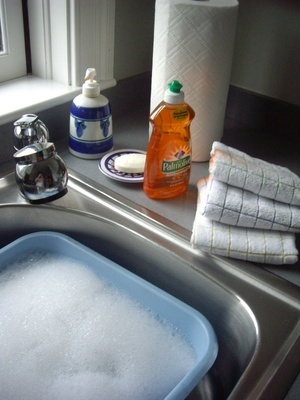 If washing up by hand, a drying rack is better than a tea-towel; these often harbour bacteria. If you do use tea-towels, wash them frequently and hang out to dry after use. Change dishcloths frequently. Always wash your hands before and after cooking, and wash vegetables and fruit.. Keep meat separate from other vegetables and try to use different chopping boards for different products. Reinforced glass or plastic boards are cleaner than wooden ones. 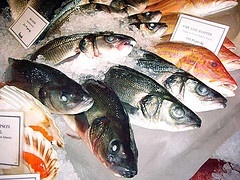 Try to keep animals out of the kitchen, and avoid smoking. Never wash up pet bowls with your own crockery. bind up any cuts or open wounds immediately. Empty food rubbish bins daily, and clean the bin regularly. These rules are very useful for following good hygiene in both the kitchen and in life!